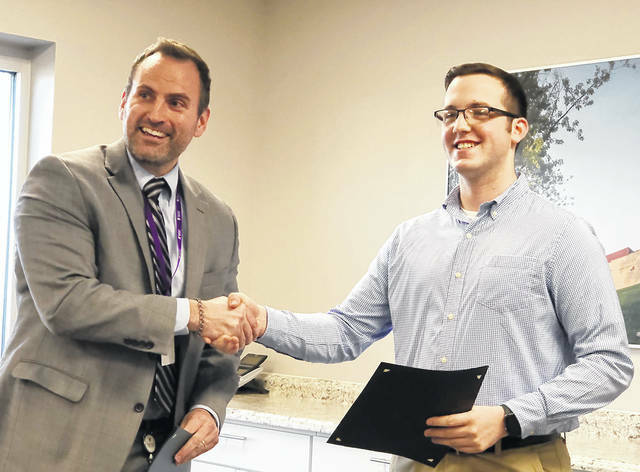 Casey Petrae, right, was presented an Aviator Achievement Award by Superintendent Rob O’Leary in recognition for his being chosen as the Butler High School winner of the Dayton LaSertoma Club’s Youth Service Award. 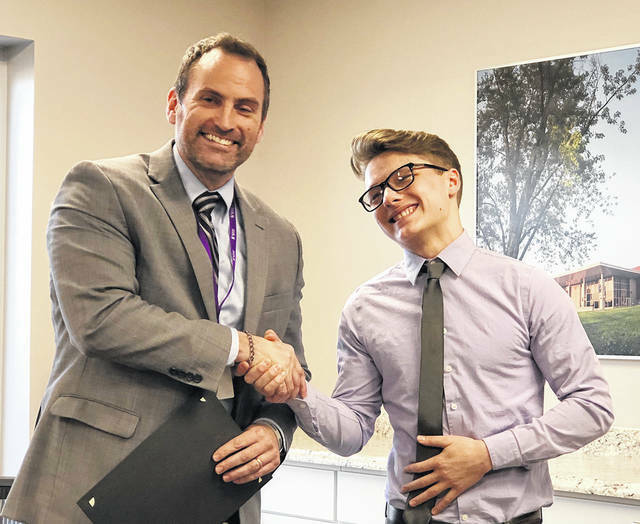 Dalton Shepler, right, was presented an Aviator Achievement Award by Superintendent Rob O’Leary in recognition of winning the pole vault competition at the 2019 Indoor Track & FieldState Championship and a fourth place finish at the New Balance Nationals. 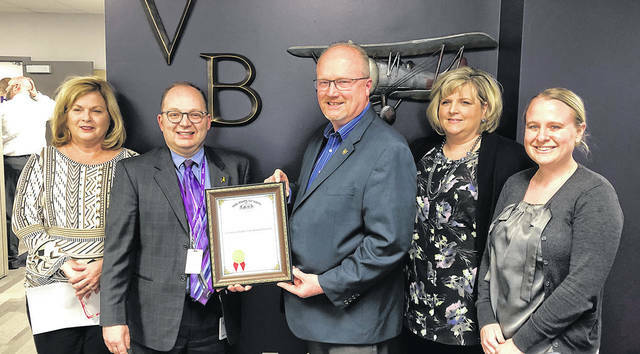 The Treasurer’s staff of the Vandalia-Butler City Schools was presented with the Auditor of State Award with Distinction on Tuesday. Pictured left to right are Fiscal Support Analyst Lori Stutz, Treasurer/CFO Eric Beavers, Auditor of State representative Joe Braden, Assistant Treasurer Leigh Anne Snow, and Payroll Coordinator Kari Magill. VANDALIA — The Vandalia-Butler Board of Education rejected an AP Psychology textbook due to its treatment of gender identification and definition on Tuesday evening. The book, Myers’ Psychology for the AP Course, was recommended by staff but failed to garner a single vote. Board Member Mary Kilsheimer was first to express her reservations. “I have received a call from a community member who has reviewed the book and had the same concerns,” said Board President Holly Herbst. Board Member Kent Zimmerman, who moved to have the textbook adoption broken into segments to vote on them individually, also had concerns. “While I appreciate that the book addresses the standards quite nicely, I’m wondering if there might be alternative ways to approach that course without using a textbook that deals with this topic in a rather awkward way,” he said. Ultimately, all five members voted to approve the other three textbook recommendations while rejecting the Psychology book. Also during the meeting, Treasurer Eric Beavers and his staff were presented the Auditor of State Award With Distinction for the district’s 2017-18 financial audit. The Award with Distinction is awarded to entities that file timely financial reports with the Auditor of State’s office in the form of a CAFR (Comprehensive Annual Financial Report); the audit report does not contain any findings for recovery, material citations, material weaknesses, significant deficiencies, single audit findings or questioned costs; and the entity’s management letter contains no comments related to ethics referrals, questioned costs less than$10,000, reconciliation, findings for recovery less than $100, nor any public meetings or public records. 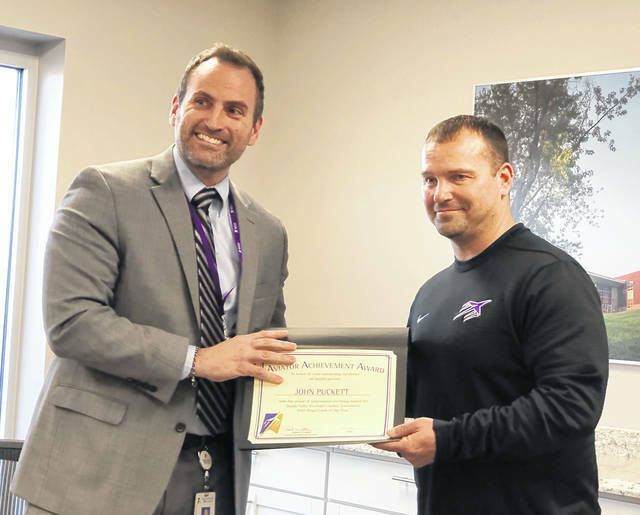 Beavers thanked his staff including Lori Stutz, Leigh Ann Snow, and Kari Magill. “I set the vision, but they are the ones who execute the plan,” he said. Approved the purchase of two 9-passenger vehicles from Cardinal Bus Sales & Service at a price of $47,425 each.